The beautiful city of San Diego is the second largest city in California and is located 120 miles south of Los Angeles, immediately adjacent to the Mexican border. 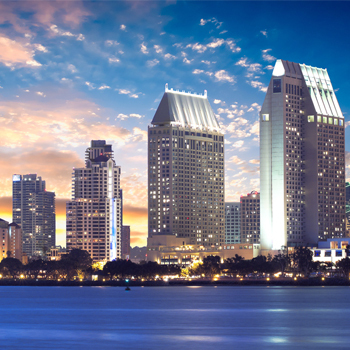 The birthplace of California, San Diego is known for its world famous Zoo and Wild Animal Park, it’s mild year round climate, natural deep water harbor, extensive beaches, and long association with the U.S. Navy. San Diego’s main economic engines are military and defense related activities, tourism, international trade, and manufacturing. The presence of the University of California, San Diego (UCSD), with affiliated UCSD Medical Center has helped make the area a center of research in biotechnology. Travelers going to San Diego will want to rent a car to see the many sights and sounds that this beautiful city has to offer. Economy Rent A Car serves the San Diego airport and offers a wide selection of current model vehicles to ensure you can rent the vehicle that will meet your every rental car need, at a very competitive price. Please be sure to check out Economy Rent A Car if your travels bring you to San Diego.